Not to be confused with Catch a Tune. 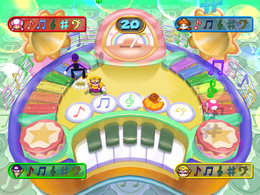 Catchy Tunes is a 4-player minigame that is found in Mario Party 7. The name is a pun on the phrase "catchy tunes" since the characters have to catch falling music notes. The introduction of the minigame shows all of the music notes falling on one of the two xylophones making musical sound notes after they hit the ground and disappear. The screen then fades and then it shows the whole play field that has the players on it, then the minigame begins. Two players are on the top side between one of the two xylophones while the other two players are on the giant piano keys; those two players have to jump to get to the top side where the other two players are. The players attempt to gather five different music symbols that fall down onto the ground within the time limit of thirty seconds. Each different music symbol is required to win the minigame. The players' dialog box on the screen indicates which certain music symbols are collected and which ones are not collected. The music symbols come from the sky and fall down onto the floor; the shadow of a falling music note hints that there's a symbol that is going to hit the ground. If a music note hits the ground, it disappears and cannot be collected. The players can stun others by simply jumping on them; if a player is stunned, they can barely move or jump for a brief moment. If one of the players successfully collects all five different notes before the time is up, that player wins. If the time is up and players didn't get all the required notes, it is considered a tie. The losers stand in a row behind the winner, who does his or her victory animation. Rules –"Run around and collect the falling musical symbols. You must collect one of each kind to win." Advice – "Watch the shadows to predict where the symbols will fall. You can also jump on other players to stun them!" This page was last edited on February 15, 2018, at 01:14.